GOP presidential candidate Ben Carson isn’t on Stacey Dash’s side when it comes to her comments stating that BET and Black History Month perpetuate segregation. Dash’s comments during a recent Fox News appearance weren’t at all surprising, coming from her, but they were definitely clueless. The Fox host asked Dash if the reason she doesn’t think the U.S. should observe Black History Month is that there isn’t a White History Month, and she agreed. But there’s one conservative who isn’t siding with Dash, and that’s Carson. During an appearance on the BET special #AllVotesMatter, Carson expressed his sentiments about Black History Month. Hell, without Black History Month, how many kids would learn about Carson’s medical endeavors? Because we all know we’re trying so hard to forget about the political ones. But, of course, Carson had to go and put his foot into his mouth. He just couldn’t leave well enough alone. 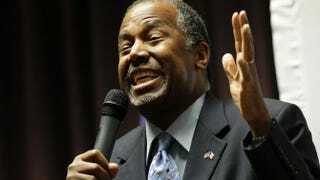 “Our ethnic diversity is not a problem unless we make it a problem,” Carson stated. He was doing so well, and then went and ruined it.